I'm published! Woo!!!!!!!!! 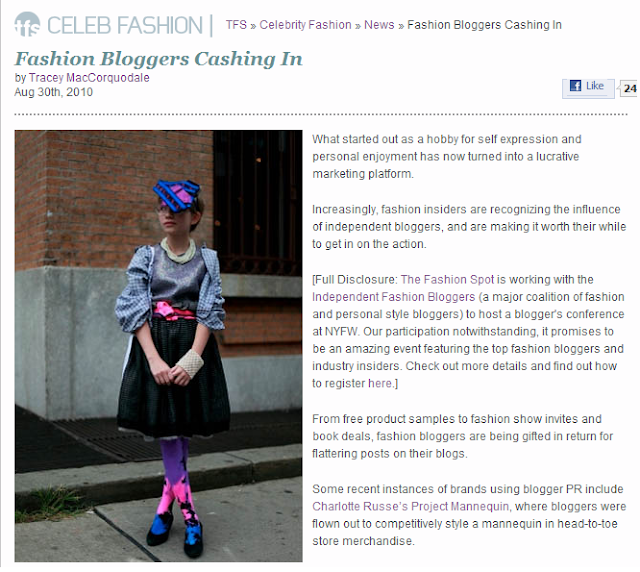 I have just started writing for The Fashion Spot and I am pretty psyched about my first publication Fashion Bloggers Cashing In, which I have noticed a little late (it was published on August 30th). Andrea Grant the Managing Editor reported it was a popular article too so that makes it twice as cool to report. My full last name I am using for my freelancing, although I still want to be known as Tracey Quo professionally. I'm just tired of people looking at my last name and having to take a deep breath before stumbling awkwardly between the vowels (it's pronounced ma-core-ca-dale in case you were wondering). I have actually been writing on the TFS forum for many years now; almost 8 to be exact. I first came across it when googling Sienna Miller to discover who this supposedly new Kate Moss was in all the tabloids. I've been a frequent poster ever since and have watched it evolve tremendously. It now has an estimated 2,056,400 monthly visits. And as a poster who has accumulated approximately 35,000 posts on their forums, I honestly believe I helped the forum's growth quite a bit when it was first developing (it was launched in 2001). It's interesting to go back and read my fashion insights as a 16 year old, like looking back on my growing obsession. TFS definitely fed it. Like you, I have been on TFS for 8 years - since the summer of 2002. It IS really funny to see older posts, too... very strange! Anyway, congrats again - you're such an excellent writer. Well done! It's a great post! It's always exciting to see your work published!